I present before you five Project Managers who have shared their invaluable knowledge here this New Years eve about what aspiring Project Managers should do. There’s a reason why I decided to ask these Project Managers for their advice. Each of them individually have helped me groom, inspired to become a Project Manager and opened doors I would have otherwise not known. I met him through my blog. When I first started writing my blog, I remember Alec being the first of the few to leave a comment saying, if I had any questions about CAPM, I could ask him. I had just started writing (this blog) and it was a nice surprise to have a real Project Manager commenting. It made my day! I didn’t ask him any questions about the exam but I surely started reading his blog. Alec sent me good wishes and tips the day before I appeared for my CAPM. I thought he was really kind and nice to inspire someone like me, who he didn’t know personally and was rather new to the industry. I learnt from Alec to inspire others, help when I can and be a Project Manager who is also a good human being. Thank you Alec for being such a inspiration. So you're an aspiring project manager? How fortunate you are to be part of such a varied, exciting and potentially meaningful career. The best project managers truly make things happen for the benefit of their customers, team members and companies. The skills of a good PM will always be in demand. As a project manager, one of your most important projects is your own continuing development. This project will always present you with an abundance of tasks on which to focus. Here are three which have great potential to increase your competency and satisfaction no matter what your current experience level may be. 1. Devote at least as much attention to Stakeholder Management as you do to Project Deliverables. Stakeholder management refers to the effort you expend on identifying the people your project impacts, developing productive two-way relationships with them, and maintaining the proper level of communication with them over the whole course of the project. Communication is the art of listening, identifying areas of divergent understanding, and bringing any such items out into the open so that they can be resolved. It's very easy to get in the habit of focusing on your deliverables to the exclusion of all else. Beware this trap! The better you manage your stakeholder relationships, the more successful your project will be. As a project manager, your time is one of your most valuable possessions. If you get in the habit of making time to spend with colleagues, you will find that your efficiency, productivity, and enjoyment of your career will be greater than it would be otherwise. · Develop relationships with people outside of your current company whenever possible. 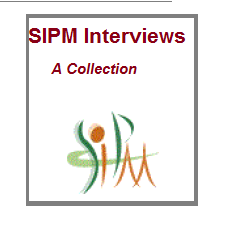 · Start a "brown bag" or information sharing series with other PMs at your company. · Volunteer to mentor new people at your firm. Aim to meet for coffee at least every six weeks or so with the 4 or 5 other project managers you wish to develop long term relationships with. Contact them through IM or email at least every few weeks. This will ensure that you will be there for them, and they will be there for you when a project management or career question arises. Like most things that are worthwhile in life, the true value of this habit takes years to reveal itself. Start now. Think about committing yourself to personal development. Identify your areas of strength and opportunities for growth. If you are stronger in the area of technology than in people skills, consider putting twice as much effort into your development of "soft skills". One way to do this is to commit yourself to reading 5 pages a day "more days than not" in the area of personal development. If you identify a need to learn more about the tool of Visio, and also about effective listening, you might choose to work through Crucial Conversations first, then The Visio 2003 Bible, and then Yes! 50 scientifically proven ways to be persuasive. 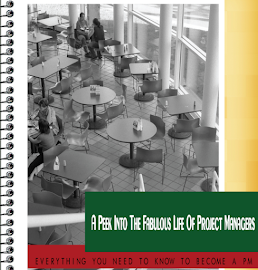 Even though it seems like 5 pages a day is not much - over the months and years you will put yourself light years ahead of most other project managers in terms of your knowledge and skill. Welcome to the profession of project management. You're very much needed. We're glad you're here. I started reading his blog long ago and have learnt much through his writings. My communication with Baas started through Twitter and thought he adding me to his list of “follows” was an honor and more so to know he read my blog. He was the first to agree to do the post, an assurance that I really needed. I was rather nervous to ask these 5 PM’s and questioned myself that perhaps it was a hasty decision that was better avoided. Baas I can’t thank you enough. - Get a certification, or follow some formal training. Good for you resume and you probably learn a few tricks. - Don't take formal training too serious. It is just ONE way of doing things, there are many, many more. - Get on the Internet and start conversing. 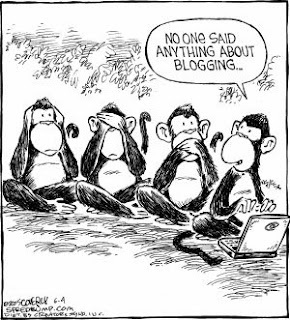 Start a blog, join a community and join the conversation. - Always, ALWAYS remember: projects are about people. Never forget you are dealing with other human beings. 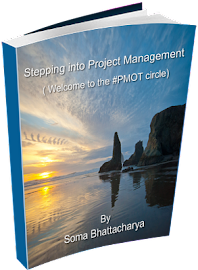 I took my first steps into Project Management with her…..well, with her blog actually. I can’t remember how I found her blog, but I sure read it everyday at lunch. Every single day. I loved the fluidity of her language, the easiness with which she wrote about Project Management and somewhere down the line, I simply got interested in the profession. I researched about being a PM and if it was something I could do. I wanted to commit to myself and clarify my own thoughts about wanting to become a Project Manager, so I started this blog. Then one fine afternoon at lunch as I’m reading her blog- I suddenly realize I'm reading her posting about my site. I freeze and then re-read. It was the moment and I've never looked back. I knew there would be more visitors to my site and perhaps I should start writing seriously. Elizabeth has rather unknowingly been one of the most important factors in deciding my course as an aspiring Project Manager. Thank you forever. I'm not sure I can come up with three must dos. To grow as a professional I would say network, learn as much as you can, and gain technical proficiency through experience and qualifications. You don't actually have to have the qualification; you just have to understand the theory of, say, PMBOK. I had heard a lot about pmstudent and then I found one day that Josh had emailed me, asking me if I would like to blog for pmstudent. I didn’t have to think on this one, sure I wanted to, who wouldn’t. I think the best part about Josh was that he started with a PM degree and then got the PMP certification, so I asked him if he could elaborate in the post on how he prepared himself for the job. Thank you Josh for giving me the chance to be associated with pmstudent. First, some background. I spent many years as a manager and developer until I discovered my true passion for something called project management in 2004. I had been doing much of it for a long time without knowing there was a formal discipline for it. Now, for my "3 things aspiring PM's should do"
Go get some experience - At work, talk to project managers and volunteer to help out. Or, you can volunteer for PM and other organizations where you may get the chance to work with experienced project managers. Learn from the people who have been doing it already! Go get some education - While formal education like the BS degree I went after is great, it is a massive investment. I highly recommend it, but it may not be for everyone. You can also get a lot of education by reading articles, blogs, books, doing training courses, etc. Go write about project management - The great thing about web 2.0 is that anyone can put content out on the internet. My personal experiences with blogging have been a tremendous boon to my evolution as a project manager. By blogging, you can get feedback from others, clarify your own thoughts, and explore ideas through writing that are difficult to formulate all in your head. You can sign up today at pmStudent.com and start blogging immediately, getting your posts out to an established readership without having to go through the hassle of setting up your own blog. I really wanted to have 5 Project Managers for this special post. I read about her blog and her posts almost everywhere and yet somehow I never had the chance to read her blog. So, I asked Alec and Elizabeth if they knew anyone I could request to be part of this posting and surprisingly both of them mentioned Raven. I emailed her, it was awkward because one I didn’t know her and two the first things I say is I am doing a post and would you be kind enough and have the time to be part of this. I didn’t receive her reply for a couple of days and it made me more nervous, thinking that perhaps I shouldn’t have emailed. She replied back and to my greatest surprise agreed to do the post and couple of emails later I’m thankful that I had the chance to know her through my blog. Thank you Raven for doing this, it was a complete surprise. The Team Is Key- Your project team is the key to your success--you cannot complete the project without them. Take care in communicating with them effectively, and establishing a communication plan from the beginning of the project. Treat the people on your project team with respect, give them room to grow as individuals and as a team, and always be there to support them as needed. Be swift and judicious in communicating project issues and changes--think quick and concise as a lot of content flies around and the project team doesn't need to be bombarded with the tons of reports you get, usually the condensed version will do. Remember the project team is made up of living, breathing people and they want to be kept in the loop too, but not so overloaded that they can't do their own job! Develop Yourself - If you think your job is done when you put in an 8 hour day, it's time to look for another career now. Project management is more than a full-time battle...and half the battle is finding ways NOT to let the field take over your life. Set aside time each week to pause, reflect and grow. Read a few chapters of a professional development book on project leadership, effective communication or how to negotiate better; browse a few blog posts on innovative ways to be more productive in meetings; subscribe to project management podcasts and listen while you walk at lunch or on the drive home. There are many ways to develop yourself, so plan for alone time, and move yourself forward in your career. Most importantly - never stop learning! I could read a book a week for the rest of my life and still learn something new every day. Now how fun is that?? I hope we all take the lessons home and start the New Year with the right knowledge and determination. Happy New Year everyone! 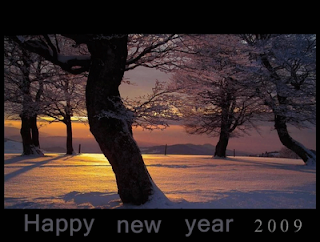 All the best for 2009. The year 2008 has been extremely special to me. I started my blog, started writing extensively about PM, prepared for the exams (certifications) and was determined that this is what I really want to do for the rest of my life. I have learnt more than I imagined, have got some great advises from amazing Project Managers and connected with them whose sites and blogs have helped me learn the trade. Being smart isn’t enough, having the right attitude is. Be very clear about your goals. Enjoy your work, it shows. Resource management is the toughest. Make your everyday work life creative, find out ways/things that interest you. A blog helps to seal your point of view and show your genuine interest for the profession. Project Manager’s are nice people, helpful and genuine- perhaps it comes with the profession. So, this Christmas I ask Santa that all of you (Aspiring Project Managers) should have the blessings that I have had through my blog, meet some incredible people and realise that your dreams can come true. Thank you for all your support and as a token I have a special post coming up on December 31. I ask 5 Project Managers about the three things all aspiring PM's must do and they have all graciously agreed to talk about it. I'm thankful to all of them for agreeing to do this on such a short notice. It's such an honor to have Alec Satin, Baas De Baar, Elizabeth Harrin , Josh Nankivel and Raven Young in a single post. All of them have been extremely kind to me, very helpful and such an inspiration. Above all, they have made me realise that Project Managers are supposed to be good people. Always. Merry Christmas everyone, I will be back with the special post on Dec 31! It’s Holiday season and if you have some time to spare here are a 5 things you should concentrate on right away. Read - It’s time to do some extra reading, learn as much as you can. Overcome Obstacles- If you know something you should overcome, start prepping for it. If you want to be a better speaker, try picking up a subject and work on it. Ask your friends to hear you out and take their feedback seriously. Work Out- It’s important to be healthy, make sure you are making the right choices when eating out or indulging in the holiday treats. Simply schedule an exercise routine you can maintain. You will have more energy and determination than before. Make New Friends- We all know it when we have struck the right note. It’s important to find friends who have similar goals, going through the same struggle or people whom you admire- it just makes it easier to bond and connect. A good supportive circle of friends can get you through anything and help you reach your goal. If you have wanted to thank your team, friends, family or mentor- it’s not late. Do it today, send an email or a e-card or just call them up. Enjoy- This holiday season, help out someone else in fulfilling their dreams and hope. I’m sure all of us have been inspired or helped by some one else at some point, make this Holiday Season a time to reach out to others. Any work space whether in office or home in most cases is the reflection of your image. 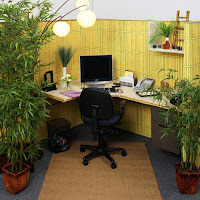 Your work style can easily be evaluated by simply visiting your cubicle or desk. A white board with projects names and the to-do list for the day/week. Out of the 10 articles I have read in the last 2days, perhaps 8 of them talk about networking. I know it's necessary, so do you. What about it? If you read my review for Beyond Code; see the Take Home section at the end of the review. 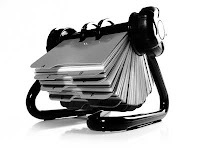 Relationship Journal is what the book and the author Rajesh Setty emphasizes. It's a must and you cant go wrong if you can maintain it. Sure I read the book, I even tried reviewing it. 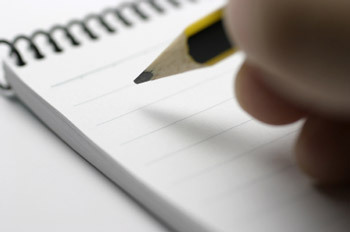 So, did I start keeping a Relationship Journal? Yes, I just did. I read Alec Satin's post this morning about Highrise and guess what, I signed up for Highrise! This is really cool and I must tell - you are free to sign up for a FREE account. You get to keep 250 contacts and can upgrade to the paid version if you think it's necessary. So, I created mine and added Alec as my first contact. Well, he told me about it. So, begins my relationship journal. I have used similar version for the project communication at work, never for my personal contact management. It's a great tool and am glad I signed up. Here's the link, just incase you would like to see how it works. Alec Satin talks about the Traits of a successful PM, in his blog. Develop a consistently positive attitude. Be a master at setting goals and achieving them. Have a clear vision of what success means to you and to your project. Do what you say you will do without exception. To learn more keep reading. Oh yeah, we all have read about PM terminologies- some from the PMBOK; others from blogs or Wikipedia. But here's something you might want to know. Bill Duncan talks about price estimate terminologies and their differences which we should know. If you are someone who blogs regularly, here's a hint about how to get your blog popular. I stumbled upon the term Search Engine Optimization few months back while working in a project which had SEO part of it. It's fascinating to know how internet, well rather Google works. Why we see the site we see. When I started blogging, I just did what I thought was right and I would like to read. I didn't have any intentions to optimize my site and I never did. My interest was triggered when I suddenly saw my blog rank (page rank) 2. Not bad I thought, 5 months into blogging and it ranked! Than one day, the rank was simpy gone. I didn't change anything, I still wrote the way I write and enjoy every bit of it. So, I just decided to ignore the entire thing. While doing some research about SEO for a project, I read the article on how to optimize a blog and thought that was rather interesting. 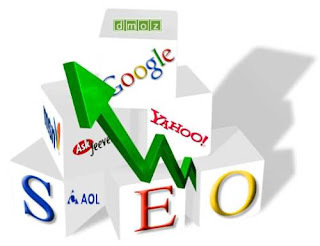 If you are one of those who optimize along with writing, well you already know about SEO. If you don't, the information is worthwhile. I don't think I will be changing very soon the way I write or think just because I need the page rank back. I would rather prefer more visitors to my site and see how they react. Of course, if it comes with an added bonus of a Page Rank -good enough I say. Actually more than good. I like being appreciated once in a while for my hard work and if it comes from Google, why not? P.S. Can I please have a minute of your time and if you could please vote for the poll (on the right hand side) would be greatly appreciated. Thanks in advance. Discussing ideas is what Rajesh Setty has done so stylishly in his much coveted book BEYOND CODE. His e-book is 145 pages (has blank pages inserted) and before you think it would take too long to read, let me remind you- its one of the fascinating books we all look for. Once you start reading it, chances are you will finish it the very day. The review is my own understanding of the book and points that I would like to remember. Please note that this review is not in any way a replacement for the original book reading experience. Your ROI (return of investment) will be much higher than you expected. You have the book free (link given below), so all you invest is your time. The book is perfect if you are looking forward to imbibe some valuable changes into your personal or professional life. The language is simple and straightforward with points and anecdotes and experiences shared from the authors own life. Believe- Trust the author and the fact that you would like to bring in some change. Participate – You have “accountability forms” running throughout the book! Personalize the read- Take the lesson and use it your way. What can you (as an individual) bring that special You in the table? Read well chosen matter- Setty talks about reading 1 book/week. Use accelerated learning techniques- music increases the effectiveness of learning and yes I have personally tried it in more than several occasions and it works. Go beyond the call of duty- take extra responsibility and people will take note. Have a great attitude- a sure one, it always get noticed. Find a mentor- no matter at what level you are this helps. I have written about it in more than several occasions. Never hesitate to make a connection. Let go the HULK complex- don’t hesitate taking help from others, if they are willing to. Trying to solve all issues by yourself doesn’t help. To know amore about the complex try answering the questionnaire in p.78. Keep an open mind- listen to other ideas and people even if you don’t agree to it. Prep yourself up for your next role- if you want to be team leader, try volunteering for some of the work and know what it is to be one. Your career is all about delivering the right ROI to your employer and yourself. 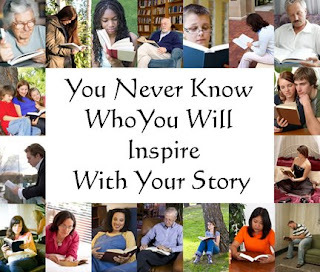 Share the book with someone- you can download the e-book right here. When I first started my Twitter account, little did I know about it's advantages. Frankly, two days later I thought I couldn't use it properly and perhaps was missing some information. Thats when I found this article at Guy Kawasaki's blog. Its absolutely mind blowing and a must read for everyone who has a twitter account. I am sure it's a great marketing tool if you are keen on building your brand or market your product (website or services). However, it can be turned into a great Project Management tool as well. Tweet with some PM experts and you can get solutions to your problems and even have some light moments communicating with your team. If your team's not techsavy, who else should be ? Of course it also allows your team to be on the edge on emerging technologies and will encourage them to share new tools and technologies with all. Share the work list and team meetings in the twitter way and it could turn into a great tool for team building and sharing information. Here's a tip if you are a new Twitter user- Install Google Desktop and then get the Twitter gadget from the site. You can update your tweets by this gadget alone and you dont need to login to the site everytime.